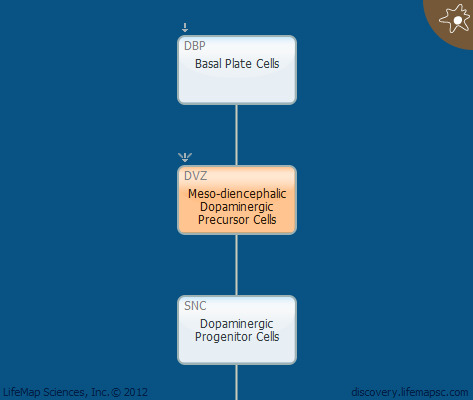 Meso-diencephalic dopaminergic precursor cells are specified towards a dopaminergic fate and away from other fates, such as serotonergic neurons. These cells are mitotic cells propagating in the ventral aquaductal ventricular zone. Later, they migrate ventrally along radial glia to their final destinations in the tegmental mantle layer. Meso-diencephalic dopaminergic precursor cells probably arise from both the caudal diencephalon and from the mesencephalon floor plate and basal plate. It is postulated that the cells that finally reside in the substantia nigra pars compacta (SNC) originate from the diencephalic basal plate, while the ventral tegmental area (VTA) dopaminergic neurons originate from the mesencephalic floor plate.